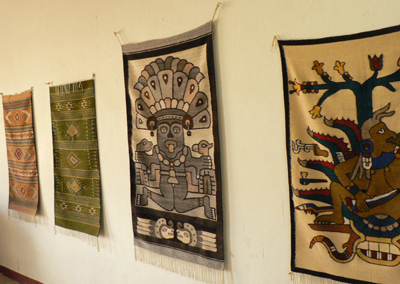 Jacobo Mendoza and his wife María Luisa operate their rug taller in Teotitlán del Valle from their new gallery and workshop, Casa Tepeyotli, located at Avenida Juarez #91 which is the main road into Teotitlán del Valle. There they have many rugs to show you as well as pictures of rugs that can be special ordered, particularly larger rugs. 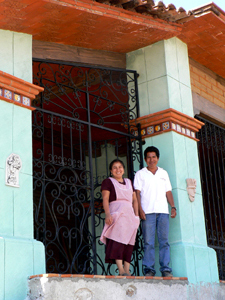 Jacobo and María Luisa built their new tapete gallery and workshop over the past few years. It is in a beautiful location and the spaces they created are lovely. Jacobo is represented in the US by The Folk Tree in Pasadena CA (626-795-8733). 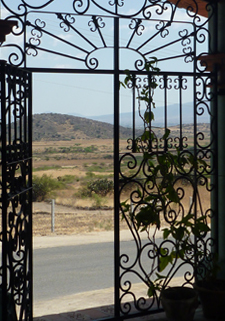 He has held exhibits in Oaxaca, San Miguel Allende in Guanajuato, Cancún, Seattle WA, Santa Fe NM, Austin TX, and the San Francisco Bay Area.